The certification program offers students the possibility to incorporate an individual focus on sustainability into their regular courses of studies, thus enabling them to acquire the competencies conferred by a higher education program in sustainability. Additionally, the program aims to bring together students within the TU Berlin with a particular interest in sustainability, thus promoting an exchange of ideas beyond the classroom. Completion of the 6-credit point compulsory module for all students of the certification program: Critical Sustainability – the Interrelationship between Technology, Nature, the Individual and Democracy. The module is offered as an integrated course consisting of interactive classes and a project laboratory to be held over several days. Completion of two courses carrying 6 credit points from the two compulsory optional subject areas of nature/technology and the individual/society. These modules are, generally, existing modules from a student’s own degree program or free electives. Existing courses can be assigned to one of the two compulsory optional subject areas at the recommendation of any members of the TU Berlin and after approval. Active participation in events within the framework of the certification program, such as discussion rounds, workshops, coaching sessions or mentoring. Such events can also be offered by current or former participants of the program. The final thesis must address aspects of sustainability and inter-disciplinarity. Acquiring competencies through the certification program. The learning outcomes of the certification program are aligned to the 12 core competencies or Gestaltungskompetenzen of sustainable development devised by Gerhard de Haan within the framework of the UNESCO Education Decade bearing the same name. The key element for knowledge transfer is the integrated course which fosters a critical understanding of sustainability as well as a broad general understanding of related societal and ecological issues. In the project laboratory, students can participate in the process of societal co-creation by working together on inter- and transdisciplinary projects, thus acquiring key competencies of cooperation. The requisite subject knowledge and skills are primarily to be acquired on the modules within the two compulsory optional subject areas. This two-part categorization further provides participants with a deeper insight into a specialist discipline other than their own, thus fostering an interdisciplinary approach. Key issues concerning organization and content to be finalized during the summer semester 2017 and the winter semester 2017/2018 are: 1) the exact certification conditions/guidelines for the awarding of the certificate, 2) the selection of compulsory optional modules, 3) development and implementation of the integrated course consisting of teaching class and project laboratory, each providing a focus on nature/technology and the individual/society, 4) public relations activities/publications, 5) administrative implementation 6) accompanying evaluation and 7) alumni work. The compulsory optional courses to be offered are to be decided upon by the start of the winter semester 2017/2018 so that participating students are able to select the appropriate courses. The module Critical Sustainability can be taken from summer semester 2018 on, enabling students to obtain the sustainability certificate at the end of the summer semester 2018. There will be an interim evaluation at the end of the winter semester 2018/2019, on the basis of which the Council for Sustainable Development will make a recommendation to the Executive Board concerning either the continuation or the termination, ahead of schedule, of the trial period for the program. 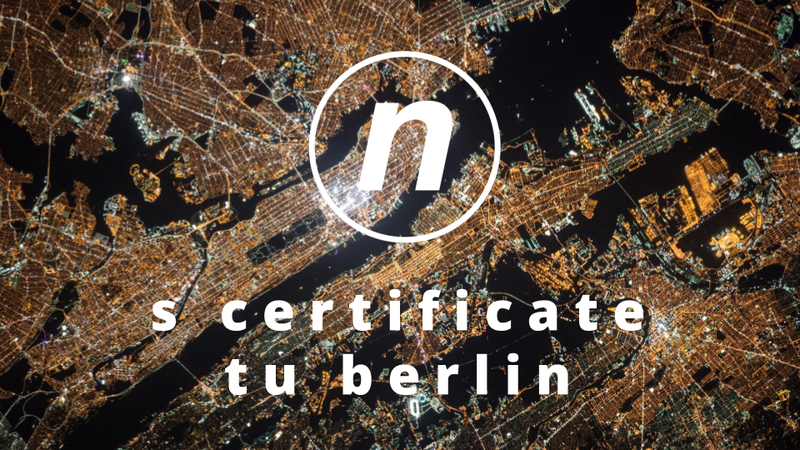 The Executive Board of the TU Berlin introduced the certification program at the end of April 2017. The certificate is awarded by the president on the recommendation of the Council for Sustainable Development. The Council for Sustainable Development is responsible for policy decisions relating to the certification program. These include approving guidelines for the awarding of the certificate as well as the recognition of courses and modules which can be taken as part of the certification program. To assist with the process of decision-making and general support during the introductory phase, the Council for Sustainable Development has established a sub-committee to which all members of the TU can contribute.